AutoCrib® News | No Phones Allowed! There are a number of places where phones are strictly prohibited, including military facilities, intelligence centers, research and development facilities, data centers, and other locations that require a high level of security. Data Centers - These facilities are expansive data repositories that take data security very seriously. Data Centers must eliminate all possible threats, including theft of data, and malicious injection of viruses, worms, and other malware that render information systems inoperable. As our society becomes ever more dependent on computers and the free flow of information, these data warehouses must become high security fortresses. One of the biggest fears is cyber threats via personal electronic devices (PED). To ensure that external programs and data cannot infect the server farm, and internal data doesn’t leave the facility, it is imperative to keep personal electronic devices out of restricted areas. Government Agency – Government entities must protect national secrets, as well as citizens’ personal data. PEDs (tablets, smart phones, etc.) are becoming a problem for government agencies. These agencies struggle with internal leaks through videos and recordings, and theft of confidential information. These occurrences are damaging to the Nation’s security. The West Wing of the White House has recently banned the use of personal electronic devices. This is happening in many federal-level departments; state and local level agencies will follow in due time. More employers are requiring employees and guests of the organization to leave cellphones in their cars or at the front desk. This can create a morale problem: leaving a phone in the car increases the risk and probability of personal belongings being stolen from the vehicle. Another problem is the parking lot may be too far away, which makes it difficult to check your phone while on breaks, especially if your guests or employees have urgent calls or messages they might miss. Asking for cell phones to be left in the car can seem unreasonable to employees or visitors. One solution is installing small lockers in your lobby. This comes with its own set of problems. This may eliminate long walks to the car, but lockers can take up a lot of space. If an employee or visitor lose the key to the locker and there isn’t a backup with the front desk (because the first key had been lost previously), there is a cost for a locksmith service. The cost of drilling out locks several times a month because of lost keys can add up over time. Between the cost of more space to grow your offices and the cost to replace locks, you are wasting money at the expense of your security. There is a way to ensure safety and security of your technology systems while maintaining the morale of guests and employees, by protecting their personal cell phones. 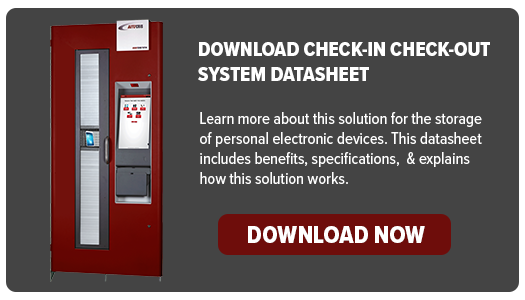 Using the Check-In, Check-Out System, you can eliminate the problems of theft, availability, space and the cost of replacement in one simple solution. Decrease the floor space required to store phones by 85% when you use a compact robotic carousel system. This system doesn’t require its users to keep track of keys. Instead, a user scans his or her badge, and the system will locate a random bin for phone storage. When it comes to retrieving a phone, scan back in and the system will fetch the user’s phone. In less than 10 seconds, a user can store or retrieve his or her phone, making it quick and easy for people to access their devices. Allow users to have access to a secure and functional format that also keeps cell phones out of areas where they don’t belong.